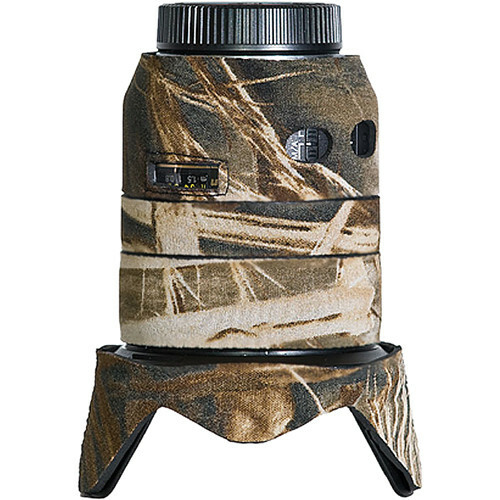 The realtree max4 Lens Cover for Nikon 24-120 f/3.5-5.6 AF-S VR Lens from LensCoat covers the lens with a 100% closed-cell neoprene coat, offering protection from bumps, jars and nicks. Available in different finishes, this new coat will allow you to blend in with your surroundings. Ideal for nature and outdoor photographers, and for sports shooters and photojournalists. LensCoat Lens Covers also provide a thermal barrier, protecting your hands from cold lenses in lower temperatures. They are easy to install and remove, leaving no residue on the lens. LensCoat Lens Covers are waterproof, providing protection in harsh conditions. Includes a clear, flexible UV-PVC window over the AF/IS/VR controls and the distance-scale window. Features a custom hole that reveals the red-dot, making for easy alignment to the camera body without having to remove the cover. Box Dimensions (LxWxH) 8.5 x 6.0 x 1.0"